As catchy and fun as this is there is something relatively disappointing about it. One thing you could always give Little Mix credit for is for being a little different, and sounding distinct; when a Little Mix track comes on you know exactly who it is, which is hard to do in a world full of samey girl groups. This one is just a little too G.R.L. for my liking and the chorus reminds me of Ugly Heart as soon as it starts. That said though it has the potential to grow on me and I do like it, and it's great to see it really come out of the gate on iTunes too. Hopefully it can be a hit for them, but for me it's their weakest lead single to date. Ben er niet tevreden mee, maar veel moet je ook niet verwachten. It does sound a lot like GRL! It's definitely catchy and I will be interested to see if it takes off at radio and becomes a solid hit on this side of the Tasman (since they haven't actually had one yet, despite SLS going Platinum). Yay for new Little Mix though. Get Weird is a little worn out for me at the moment thanks to overplay on my end! ▒ Goedkope plaat uit oktober 2016 van de Britse meidenformatie, opgericht in 2011 te Londen: "Little Mix" !!! Gepresenteerd op hun tweede deelname op TV bij de Britse uitvoering van: "The X Factor 2016" !!! De eerste was in 2011, waar de vier dames # 1 werden ☺!!! edit: Gehe nun doch auf eine aufgerundete -5*. Guter Pop-Song, der Chorus macht's aus. Stimmt, es klingt doch sehr stark nach "Ugly Heart" von G.R.L., was jedoch nur ein Vorteil sein kann, denn ich habe diesen Song geliebt. Toll gesungen und mit viel Power gehts voran. Einfach Klasse und so wies aussieht endlich der internationale Durchbruch und die erste Single-Platzierung in den Schweizer Charts nach bereits drei veröffentlichten Alben ohne eine Single, welche es in die Charts schaffte. Dit schijnt over Perrie Edwards' ex Zayn Malik te gaan. Tot zover mijn nutteloze feitjes-kennis. Little Mix maakt al jaren fijne tienerpopmuziek en dat is nog steeds niet anders. Prima single. Dieses G.R.L., wozu dieser Song offenbar Ähnlichkeiten aufweist, sagt mir ehrlicherweise nichts. An sich ist die Nummer aus meiner Sicht einfach hübscher, harmloser Girlgroup-Pop, der ziemlich eingängig daherkommt. Ist nett. Despite being a blatant rip-off of the superior 'Ugly Heart', it's a good pop song and it's catchy. The different sections feel a little disjointed and uneven in quality. This is another great and catchy track by them as the Little Mix train rolls on. Best British Single at The Brits, 2017. 35 weeks in the UK top 100. Their fourth UK#1. 286,128 copies sold while #1. Habe ich freiwillig zum letzten mal angehört. 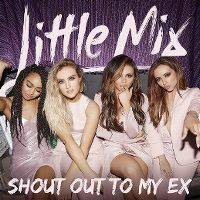 "Shout Out To My Ex" ist ein Grower und gefällt mir gut, ist zwar nichts spezielles, aber es ist catchy. Und die Girls sehen im Video einfach super aus! Not my kind of single, a little boring. Sounds like a One Direction song. It has it's catchiness factor but other than that i can't see much going for it. A pretty catchy chorus is dragged down by some sucky verses. Sehr eingängiger Song, erinnert mich vom Stil etwas an Icona Pop, könnte von mir aus durchaus noch höher charten. Aber warum man die jungen Damen im Video so schlecht aussehen lässt...?! Abgerundete 4. Wer gradlinigen Girl-Pop mag, für den ist das genau das richtige. Klingt aber schon irgendwie 08/15. It sounds a lot like "Ugly heart" by G.R.L but the lyrics appeal to a lot of people going through a divorce... Big UK #1. Gefällt mir. Freche Nachrufe auf einen Ex-Lover, eingängig ins Werk gesetzt. Das Video besticht durch vier mimisch starke Frauen, die das Selbstbewusstsein einer Frau, die sagt: I'm over it" bestens repräsentieren. Flotte Nummer. Nope, I just can't seem to get into any of their songs. Inoffensive, but annoying twee. Very annoying, cheap and tacky as per usual from them. Really not a fan of Little Mix. I really think these boy/girlband fads need to go, this is not 1999 and they don't bring anything new to the music scene. At least it's better than the other Fifth girlband. Love Little Mix's previous work but there is just nothing special about this song. I agree, it's not that bad, but i think Songs like "love me like you" we're better! Who needs those painted girls anyway? Although I have always thought of Little Mix as being more talented than Fifth Harmony, as of late, to me, I have seemed to enjoy Fifth Harmony's music slightly more. This one is catchy enough though, and around "Black Magic"'s quality. Goed in het gehoor liggend nummer. Den Refrain finde ich eigentlich recht gelungen. Trotzdem eher nichts für mich. Knapp 3*. Mag es beliebig klingen, aber auf jeden Fall gut. Inderdaad een beetje een flauw bubblegumpopliedje, laat de bubblegumpop maar aan Katy Perry over! :P Slecht is het echter ook niet. Het werd een klein hitje in Nederland. I am a fan of them but this is no Black Magic. Erst nach dem ersten Refrain nimmt der Song Fahrt auf. Ging vor 2 Jahren völlig an mir vorbei, gefällt mir aber gut.